When you lose a loved one as a result of a fatal accident, the suddenness of your loss is difficult to comprehend. Your grief pushes all other thoughts aside. At the law offices of Peterson, Berk & Cross, S.C., in Appleton, Wisconsin, our attorneys understand this. When a loved one is killed in a car accident that is the result of someone else's negligence or wrongful action, you deserve to be compensated. A settlement or court award granted in a wrongful death case can cover many things, including medical and funeral expenses, loss of wages, loss of companionship, parental support, emotional pain and more. Our lawyers understand that after a fatal accident, surviving family members are usually not able to focus their attention on the legal ramifications. We take those concerns off your mind so that you can focus on family. Our attorneys review every aspect of a wrongful death case to make sure we recover the full amount possible, in many cases reaching settlements with multiple insurance companies. If necessary, we use highly skilled accident reconstruction specialists, medical professionals and others to strengthen your case. 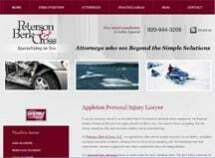 We do not rush to reach quick settlements in order to recover our portion and move on to other cases. Our priority is reaching the resolution that serves our clients' best interests. Although we like to reach a fair settlement without the need to go to court, we prepare for each case as if it is going to trial, and our attorneys have extensive trial experience. We accept our cases on a contingency fee basis, which means you do not pay attorney’s fees unless we obtain a favorable settlement or resolution for you, either through trial or negotiation.